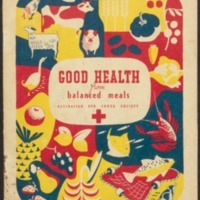 Food consumption surveys undertaken in 1936 and 1944 by the Health Department showed that some Australians were not eating the ‘right kind of food.’ These results resulted in the production of booklets such as this one, produced by the Red Cross to assist the Commonwealth Government to disseminate nutrition knowledge. It covers the basics of food essentials, providing meal charts that gave the major food categories (vitamins, protein, calories) across two types of school lunch. 24 pages : illustrations ; 23 cm.